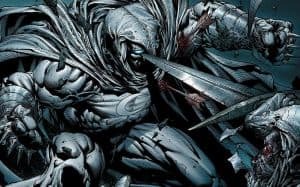 Moon Knight Netflix TV Series In Development? | Nerd Much? It looks like Marvel’s version of Batman, known as Moon Knight, could skip the big screen as originally anticipated and, instead, it looks like we’re getting a Moon Knight Netflix TV series. He goes on to say that the introduction to Moon Knight could work in the same way that the Punisher is being introduced in Daredevil Season 2 (which people are speculating could turn into a Punisher series of his own). For those unaware, Moon Knight is for all intents and purposes Marvel’s version of Batman/Bruce Wayne. He was introduced in 1975, but didn’t get his own series until five years later in 1980. He’s ultra-rich, he’s a vigilante, he doesn’t have superpowers, and he even has a cave under his mansion like Batsy. These rumors are currently unconfirmed by Marvel, of course, but it’s important to note that Marvel just recently announced a new Moon Knight comic book for 2016, possibly getting the name out there more to create interest in a Moon Knight NetflixTV series. For now, take it with a grain of salt, and if you want to hear a little more, watch the latest Collider Heroes below. Marvel also recently announced the Ant-Man and The Wasp movie is coming in 2018, as well as a couple untitled films.